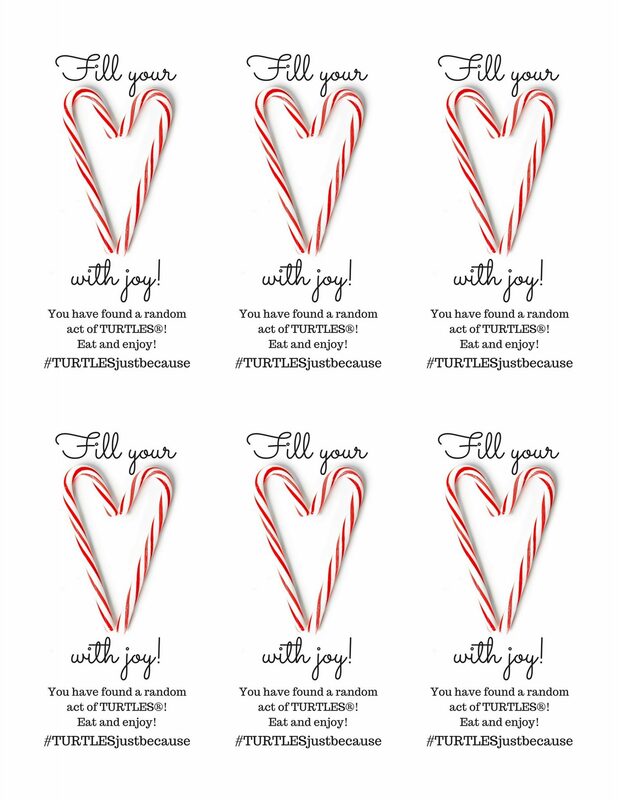 This holiday season you can spread the joy with our free printable RAOK gift tags. What is a RAOK? It is a Random Act of Kindness. 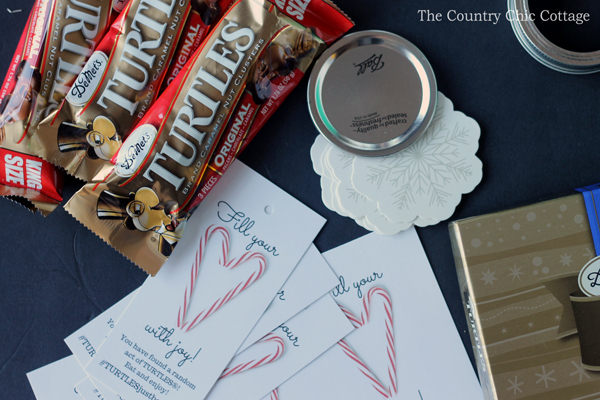 We put our own spin on the concept with the help of TURTLES® candies. Follow along below to see how we created our gifts and how you can create your own fun gifts for strangers, your neighbors, your mail carrier, bank tellers, teachers, and so much more. 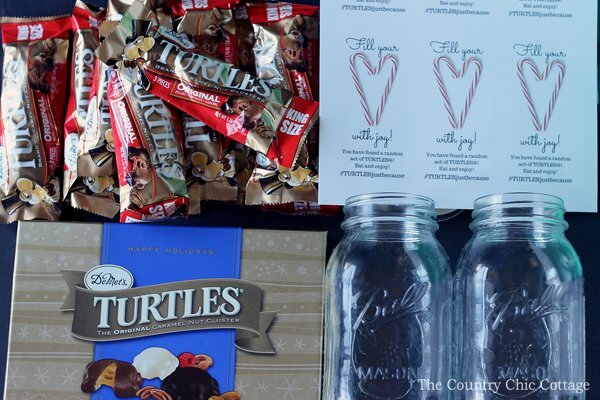 Interested in more ways to gift TURTLES® candies? Be sure to check out the TURTLES® community on Facebook. 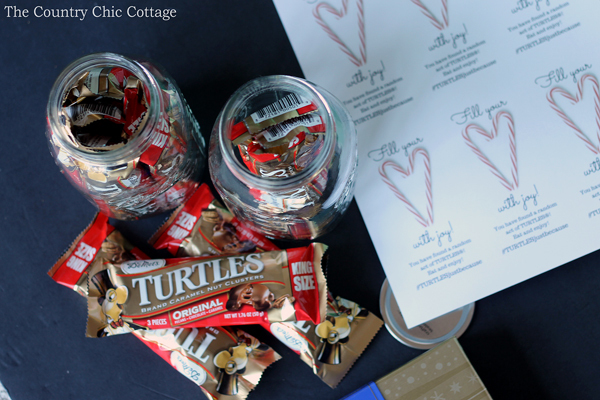 This is a part of gift in a jar week so be sure to scroll to the end of this post to see the other gifts in a jar from our blog partners this week! 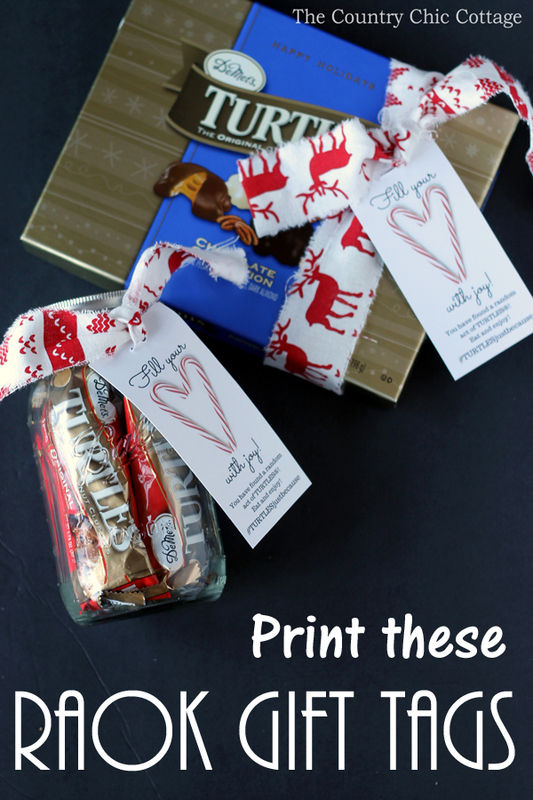 Start by printing the free printable RAOK gift tags on card stock. Cut to size using scissors or a paper cutter. Punch a hole in the top with a hole punch. For the three piece bars, we added a bunch to a quart sized mason jar. Then to cover the top of the lid, we used a paper snowflake in between the band and the lid. 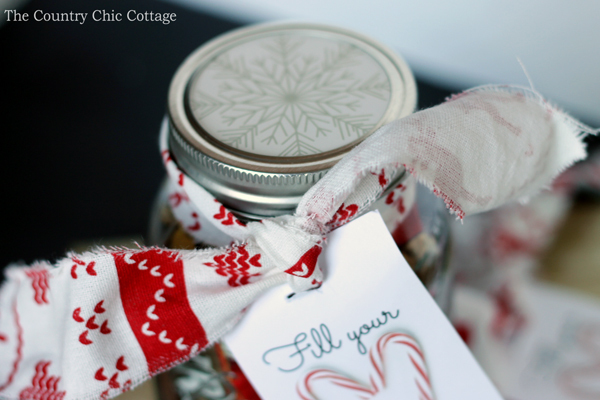 Tie on a gift tag with a piece of scrap fabric and you have a gift that is ready to give! 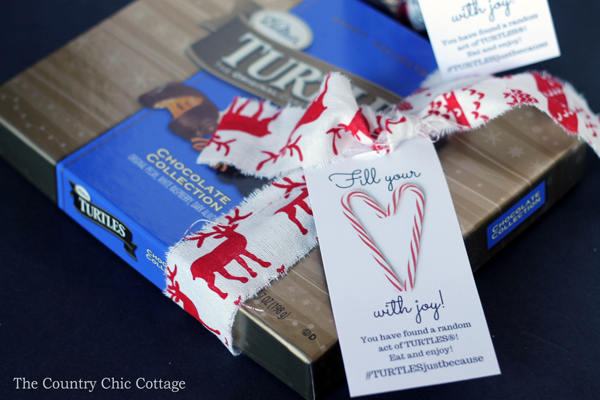 If you decide to give a TURTLES® giftable item, just tie on the gift tag with a fabric strip. Speaking of our printable tags, they are too cute right?!?! 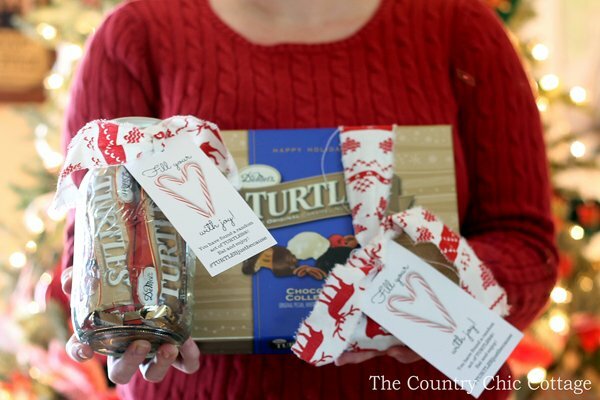 They let the recipient know that they have found a random act of TURTLES® and to enjoy! Of course we had to add in the hashtag #TURTLESjustbecause. This would be one great gift to randomly find at the park or a store. Load up as many of these fun gifts as you can carry and head out on a mission to help everyone fill their heart with joy this holiday season. 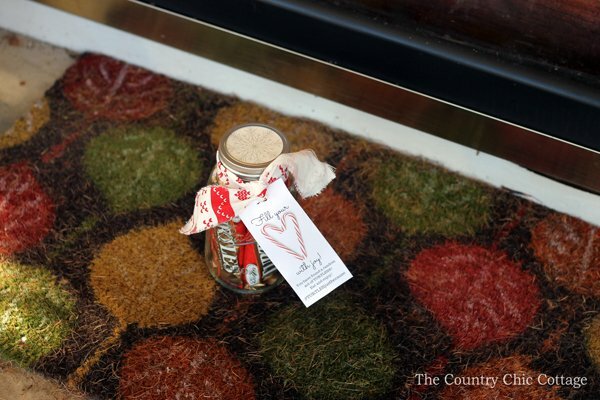 We left our gifts on the porches of our neighbors. I know that everyone of them will enjoy this little random act of kindness. After all, everyone loves the delicious combination of nuts, caramel and chocolate that is TURTLES®. Do you want to give your own random act of TURTLES®? Be sure to download this coupon to save $1 on TURTLES® clusters. Then just print our RAOK gift tags and make your own great gifts for everyone you want to make feel special this holiday season. 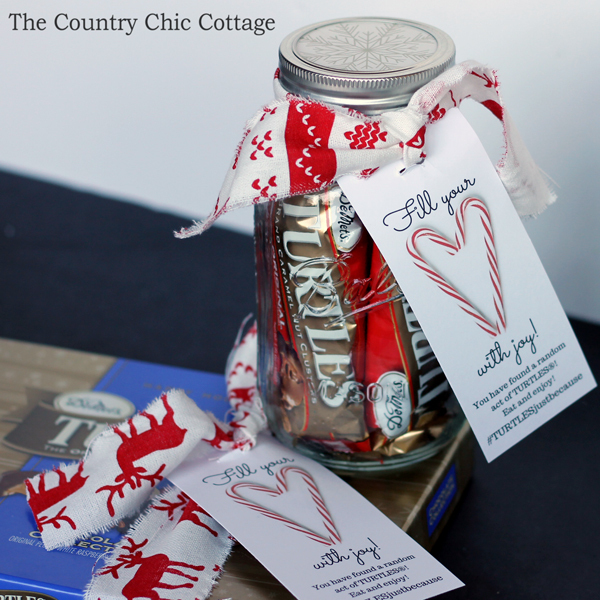 Now for the other posts for today in our gifts in a jar series. 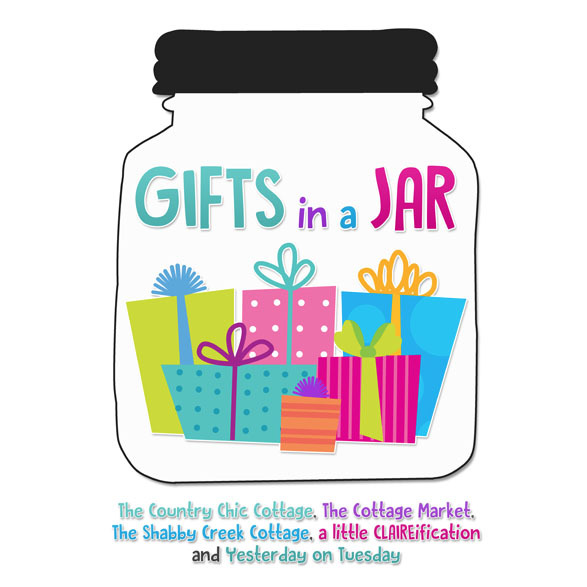 Just click on each link below to be taken to the other gifts in a jar for today’s series.